This is the 67th post in a weekly feature here at Spare Candy, called "In History." Some posts might be little more than a photo, others full on features. If you have any suggestions for a person or event that should be featured, or would like to submit a guest post or cross post, e-mail me at rosiered23 (at) sparecandy (dot) com. 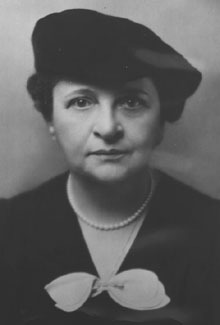 Frances Perkins (April 10, 1880 – May 14, 1965), was the U.S. Secretary of Labor from March 4 (today! ), 1933, to 1945, and the first woman appointed to the U.S. Cabinet. As such, she became the first woman to enter the presidential line of succession. As a loyal supporter of her friend, Franklin D. Roosevelt, she helped pull the labor movement into the New Deal coalition. During her term as Secretary of Labor, Perkins championed many aspects of the New Deal, including the Civilian Conservation Corps, the Public Works Administration and its successor the Federal Works Agency, and the labor portion of the National Industrial Recovery Act. With The Social Security Act, she established unemployment benefits, pensions for the many uncovered elderly Americans, and welfare for the poorest Americans. She pushed to reduce workplace accidents and helped craft laws against child labor. Through the Fair Labor Standards Act, she established the first minimum wage and overtime laws for American workers, and defined the standard 40-hour work week. She formed governmental policy for working with labor unions and helped to alleviate strikes by way of the United States Conciliation Service, Perkins resisted having American women be drafted to serve the military in World War II so that they could enter the civilian workforce in greatly expanded numbers. What would she think about what's going on Wisconsin and Ohio today? She achieved statewide prominence as head of the New York Consumers League in 1910 and in that position she lobbied with vigor for better working hours and conditions. The next year, she witnessed the tragic Triangle Shirtwaist Factory fire, a pivotal event in her life. Perkins married Paul Caldwell Wilson in 1913. She kept her birth name, defending her right to do so in court. In 1918, Perkins accepted Governor Al Smith's offer to join the New York State Industrial Commission, becoming its first female member. She became chairwoman of the commission in 1926. Following her tenure as Secretary of Labor, in 1945 Perkins was asked by President Harry Truman to serve on the United States Civil Service Commission, which she did until 1952, when her husband died and she resigned from federal service. During this period, she also published a memoir of her time in FDR's administration called "The Roosevelt I Knew." Following her government service career, Perkins remained active as a teacher and lecturer at the New York State School of Industrial and Labor Relations at Cornell University until her death in 1965 at age 85. She is buried in the Newcastle Cemetery in Newcastle, Maine. The Frances Perkins Building that is the headquarters of the United States Department of Labor in Washington, D.C. was named in her honor in 1980. Perkins is honored with a feast day on the liturgical calendar of the Episcopal Church on May 13. Having graduated from Mount Holyoke College, Francis Perkins remains a prominent figure in the school's current existence. The Francis Perkins scholars were named after her, dedicated to educating women older than the usual college student.